After participating in the Jacobite Rising of 1745, Robin and Prudence, brother and sister, become engaged in a swashbuckling, romantic adventure. Our hero and heroine must cross-dress and switch genders if they are to escape prosecution a humorous move that allows Heyer to explore the manners and language affectations of the period as the two romp through the elite saloons and clubs of London. But what the two don't foresee is that they might fall in love along the way: Prudence with the elegant and dashing Sir Anthony Fanshawe, and Robin with the charming Letitia Grayson. Can the two unmask themselves without losing their lives? 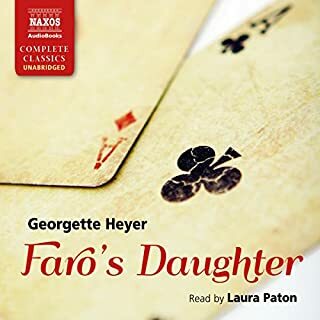 Thank you Naxos for another unabridged Georgette Heyer audio book. I was thrilled when I found this and "Venetia." Glad tidings for her legions of fans. Thank you Audible for making these available for your listeners. The narrator was perfect for the book. Her voice is clear and pure and captured Peter's (Prudence's) lovely personality, courage and loyal heart while handling the male characters with equal skill. An exciting story set before the Regency, I highly recommend this delightful book. 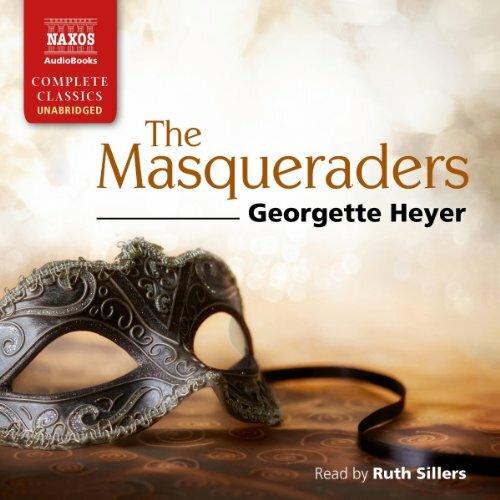 Most of Georgette Heyer's best known romances are set in the fairly sedate English Regency period at the beginning of the 19th century, but "The Masqueraders" takes place a couple of generations before that. The Hanoverian King George I has recently defeated the Stuart line of Bonny Prince Charles, so the politics are more unsettled and dangerous at this point in time. The French Revolution is 50 years in the future, so English aristocrats still emulate their continental counterparts in lavish dress, speech, and exaggerated manners. Duels are common and pretty much tolerated in a fairly permissive society. Add to this exotic setting a couple of young adventurers, Prudence and Robin, who assume gender-bending disguises to obscure their politically- and socially-suspect past. Confused prospective lovers, a couple of duels and carriage chases, and an oh-so-eccentric father add complications and hijinks galore. The story and characters are alternately charming and frustrating, as is the somewhat antiquated language assumed by the author. I believe that Ruth Sillers does a wonderful job of presenting this hodgepodge of French-accented and mannered English without often resorting to an overly arch tone. I still prefer the Regencies, but "The Masqueraders" does offer some memorable characters, stirring action sequences, and a change in style and tone. If you were expecting to find the clever repartee of Heyer's usual dialogue you will be disappointed. This is more of a farce than a whimsical romantic comedy. I am delighted by most of Heyer's stories but this is a forgettable and confusing tale. 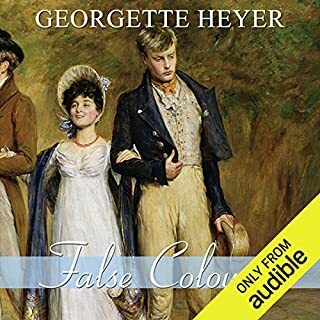 I don't especially like Georgette Heyer's early works compared to her more mature books, and I hesitated to buy this one when it became available. My low expectations were met. I might have liked it better, but I took an instant dislike to the narrator's reading, and it took me several attempts to get beyond the first couple of pages. My favorite character in the book is the twin's father, and unfortunately the narrator turned him into the buffoon. The narrator overall was annoying -- a little too sticky sweet, and actually hard to differentiate among the characters. 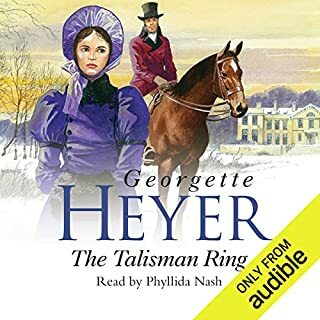 In fairness, I rank Heyer's mystery/adventure romance books like this one, Talisman Ring, The Toll Gate and others below her character-driven romances like Cotillion, Friday's Child, and The Unknown Ajax. But if you like a heavy dash of implausible adventure mixed with romance but with less depth of character and humor, this may be the book for you. Definitely not Heyer's best. Weird plot, with a brother and sister on the lam from British authorities because their father imprudently involved them in the Jacobite uprising of 1745. Sister Prudence is disguised as Peter while brother Robin dons petticoats as Kate. Unlike "The Corinthian" and "These Old Shades," two other Heyer romances featuring young heroines who disguise themselves as boys, this one just made my eyes roll. I liked Prudence's swordplay and her romance with Sir Anthony, though both were over-the-top unbelievable. Robin's romance with the nitwit Letitia was totally absurd. Add to that, I disliked "the Old Gentleman," the father whose actions and preemptory orders precipitate and drive the farce. His supposed charm was totally lost on me. The only real point of interest I found was Heyer's almost certainly unwitting but nevertheless accurate portrayal of a man suffering from what today would probably be diagnosed as mania, the "up" aspect of bipolar disorder. I suspect she may have modeled the Old Gentleman on someone she knew personally. Story is a wonderful one. Very wrong narrator. What disappointed you about The Masqueraders? The narrator, you just want to strangle her. Grating, awful men's voice. The voice of the "old gentleman" is so bad. . . ouch. What other book might you compare The Masqueraders to and why? April Lady by same author. Good story (although not as good as The Masqueraders) but again a disappointing narrator. To check contrast, try listening to a bit of both versions of "The Convenient Marriage" the better narrator is Richard Armitage and although I dislike abridged versions of books, it was an easy decision to choose the more suitable narrator. I can grit my teeth only for so long. Narrators/performers Richard Armitage, Cornelius Garrett, Michael Drew and Tony Britton would all have done the book more justice. Please get someone else to narrate and I'll buy the book again. The Masqueraders is set earlier in time than the Regency novels for which Heyer is best known. This fun romp of a book follows a brother and sister who had been involved in the unsuccessful "rising" of Bonnie Prince Charlie, and then and their father are now hiding with their lives at risk. Instead of fleeing to France, they change their appearance and hide in plain sight in the midst of fashionable London society. Sword fights, kidnapping, and plots of all sorts abound. This book is a lot of fun, closer in some ways to the Scarlet Pimpernel than to Jane Austen. I had never listened to Ruth Sillers read a book before, but she does a great job of telling this story, making it easy to distinguish characters and capturing the feeling of the tale. The story is a classic, and one of my favorite GH novels - I have read them all many times. It is set in the mid eighteenth century rather than the typical regency period of the early nineteenth, which is a nice change. As always, it is full of romance and wit and comedy, with sumptuous descriptions of the characters, the locations and the clothing. However, I think the narrator, although very good, was the wrong choice for this audiobook. Her voice is wonderfully clear, but very young and feminine sounding. In my opinion, she was unable to make any of the male characters sound even remotely authentic. Particularly the male lead, who is described as a "mountain" - her teenage girl sounding voice just did not fit the visual image. In addition, I did not care at all for her characterization of Lord Barham - she made him sound like a ringleader performing in a circus. Yes, he is described as being bombastic and conceited, but her narration was just way too over the top for me. Also, she made the villains of the story all have very nasal voices, which made me think of Snidely Whiplash of the cartoons. Just too unrealistic, particularly since the character Letitia was initially supposed to have been in love with one of them. Not likely with THAT voice! 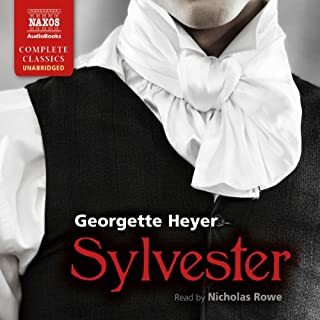 But despite my disappointment regarding the narrator, I still recommend it - absolutely ANYTHING written by Georgette Heyer is worth listening to! I find that sometimes there are parts to each book by GH that I find unnecessary to have been mentioned since they add nothing to the story. In addition, this book does not explain how the father knew certain details at the end when being questioned for verifying his identity. The story also lacks in passion, which is a GH signature. None of these issues just mentioned, however, will make me reduce my rating from a 5 star. This is wonderfully written book and very well developed characters. The story is so very funny in parts especially when considering the brother dressed as a woman and flirting outrageously with the men when he is in love with a woman. There were some absolutely hilarious moments. I highly recommend this book. Yes, I did enjoy it but it could have been so much better. The Old Gentleman who is witty, funny and completely over the top. Who might you have cast as narrator instead of Ruth Sillers? Was The Masqueraders worth the listening time? All of the Heyer canon are brilliant even with a bad narrator and abridged, although that is a real sin. No, just to reiterate that narrators make a real difference to a book and even if you have read it before it can still be spoiled. 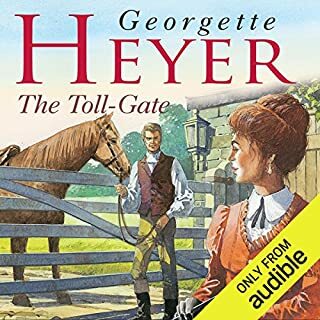 I read some Georgette Heyer as a teenager but have rediscovered her 40 years later in audible books and am thoroughly enjoying. As a lighthearted respite amidst dark who dun its these stories are absolutely charming. I hate to sound rude about anyone who is obviously very adept at their job but I found the narrator was so wrong for this story that I nearly gave up after 10 minutes. Indeed I struggled for almost half of the story, I couldn't make out who was who - and when I could the voice seemed completely wrong for the character. Having said that this is an absolutely marvellous story (and a little bit different from the rather set Heyer pieces). Be warned about the narration but grit your teeth and buy anyway. At the end of the day you'll be glad you did! Anyone who has only read/heard Georgette Heyer's books set in the early 18thC, the years around Waterloo, will find everything about this one different. That goes for clothes to behaviour to even the language and forms of speech. I think this shows how skilled she was - 1746, the aftermath of Culloden, sits almost as close to Pepys, the Great Fire of London etc as it does to post-Waterloo and Ms Heyer brings us to a very different world. The plot involves an Adventurer and his son and daughter who have lived on their wits across Europe since the younger two's childhood. The brother and sister adopt cross-gender disguises to avoid arrest after the failure of the '45, but find themselves in the heart of London society (a society long before any thought of Almacks). Their father then stuns them by arriving in London very publicly, taking what to them is a very dangerous gamble. There is humour, but not as much as other books, there are sword fights, villains and highwaymen, and there are some well drawn characters in Prue (the sister), Sir Anthony, the seemingly indolent onlooker, and personally I love John, the manservant, who deserves a medal. My favourite scene, which is the reason I've read the book more than once over the years, is the denouement of my Lord's claim (no spoilers). I have to agree with the other reviewers though - the reading is never more than adequate but you do get used to it, after a slow start, as the book progresses. What would have made The Masqueraders better? A better narrator. I once had a cassette copy of this book by, I think, Rosemary Leach. It was much better than this version. the interaction between Prue and her "Mammoth"
What didn’t you like about Ruth Sillers’s performance? Everything. It seemed so weak, ineffectual and actually boring. Spoiled the book for me really. This is, of course, my personal view and other listeners may prefer this type of reading. If you could play editor, what scene or scenes would you have cut from The Masqueraders? None really as it all seemed to run along until it finally was woven together by "the Old Gentleman" Great story. Try for the version by Rosemary Leach. This is one of my favourite of Georgette Heyer's historical romances. I thought it was fairly well read, but the reader did not have sufficient timbre to successfully portray the male characters. This story, set just after Culloden, is not a Regency romance, but a Georgian romp about a pair of adventurers. At its heart is a gender swapping brother and sister who must avoid detection to evade those hunting down the Jacobite rebels, and to avoid setting Polite Society in an uproar whilst awaiting the outcome of their father's claim to being a long lost Viscount. The problem with the narration is that Ruth Sillers fails to offer much differentiation in the voices of the different characters, which can sometimes make what is already a rather involved story become very confusing. I must agree with a previous reviewer that Phyllida Nash would have been a better choice. I love this book so was always going to be happy with the audiobook. The characters are all witty and their energy is well communicated. The narrator however lacked gravity and the voice for The Old Gentleman was terribly amateurish and ruined all his scenes. Robin and Prue were well enough done though. Sian Phillips would have made tremendous work of this though. Would you consider the audio edition of The Masqueraders to be better than the print version? 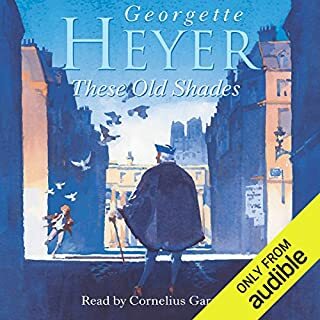 I love Georgette Heyer and her books so I was unsure how they'd translate into audio but I'm very happy with the result. It was charming to listen to and I did so with a massive smile on my face. What was one of the most memorable moments of The Masqueraders? One of my favourite moments from the audio version is also one of my favourite from the book and that is when Anthony forces Prudence to admit the truth about the Masquerade. Beautifully read. Do not let the first chapter put you off! I almost did, and would have missed an excellent audio book. Although I knew the story already, and liked it, I was really put off by the narrators voice and presentation for the first chapter and a half. Then I found I was caught up in the story and intrigue and never thought about it again. I could not put the thing down. The masquerades and characters of the two Merriots are so endearing that you just want it all to go well for them. When the "old gentleman" comes into it and takes over its smiles all the way. The dependable John watches over them all throughout saving the day more than once. Overall a very enjoyable listen! When you read a book you have an idea of how the people sound. An audio book sometimes shows that the narrator has different ideas. This story was not how I heard the people in my head when reading the book so I did not like it so much. What other book might you compare The Masqueraders to, and why? This is totally different to any I have read. Which character – as performed by Ruth Sillers – was your favourite? I enjoyed her reading of Sir Hugh. He was always a favourite of mine and she reads him well. I think the title would suffice. One of my favourite Georgette Heyer stories. Great fun and lots of characters in the plot. I was amused by the dual personalities in the tale and wasn't sure who would end up being the hero. Wonderful when the baron came on the scene with all his airs and graces and he led the story to its conclusion with great vivacity. A great tale. Love the story. Poor performance. Would you try another book written by Georgette Heyer or narrated by Ruth Sillers? love Georgette Heyer but did not think the narrator did it justice. The accent in the dialogues sounded unnatural. Could you see The Masqueraders being made into a movie or a TV series? Who would the stars be? why oh why will they try voice characterisations. I dislike females attempting male voices as much as I detest males attempting female voices. a book well read without attempting to change the voice to fit the many characters that the author inserts into the story.